I started my career as a plumber in the building trade, so being a professional Artist was the furthest thing from my mind back then. I asked a variety of Interior Designers what their clients wanted most from an artist and the answer was…flexibility, flexibility, so this is what I offered them. My relationship with the Interior Designers grew rapidly and their fit outs and installations became my main focus. Creating and learning how to paint original artwork gives me a great sense of achievement and satisfaction and I wanted to share that feeling with other aspiring artists who share a love of contemporary abstract artwork but lack the confidence to attempt their own abstract art. I found the average person was looking for original interior design abstract art for their home, not mass produced prints or expensive investment art from galleries. I felt I could provide a fun and creative alternative for people on a budget, without compromising the originality or quality of the artwork. 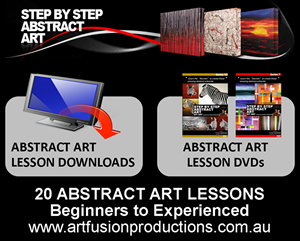 I enjoy the creativity of painting art with new styles and started developing the Step By Step Abstract Art DVD format for a range of my artwork to help people to learn to paint and enjoy contemporary/abstract art. My aim is to show people how much fun, and how easy it is, to learn to paint abstract art by simply following my easy Step By Step Abstract Art DVD…this was my motivation for developing Art Fusion Productions! In the video above, Artist Glenn Farquhar will be demonstrating how to gesso a canvas. He will also discuss the benefits of doing this and why it’s so important. The following is an almost word for word transcript of the above video. I do hope you enjoy. I have had a lot of people emailing me saying that some of their paint is either not sticking properly or not covering properly on their canvas. Usually when I talk to them and find out via email, the reason being is because of the type of canvas they are using and the fact that they haven’t used any gesso. There are a lot of pre-made canvases on the market now that come from China and India and different places like that and they are sold as premium quality with premium quality primers on them but they are not and some of them have some waxes and silicone on the canvas. This is where you have trouble with your paint. The paint doesn’t stick properly and it won’t cover properly when there are waxes and silicone on there. So that is why you use your gesso and that is why I am recommending people do. I had one lady actually phone me in Australia who had just done a class with 20 people and with all of them their paint did not stick properly and she wanted to know what the problem was. This is what the problem was: she didn’t gesso anything and relied on the credibility of that product. So I will just give you a demonstration and show you the differences when you’ve got some gesso and when you haven’t. This bit of canvas I’ve got here, when I stretch my own canvases, I buy the very large rolls because I use so much and I buy this premium quality. I will show you the difference when apply some paint to the side thats has gesso and to the side that hasn’t. It will just give you a quick little indication as to the difference. So all I am going to do, I am just putting a bit of A2 on, just because it’s the paint I have handy. You can use any paint you like. And I’ll just put a bit on this side and bit on that side. Again, this side has no gesso and this side has gesso. Now you really do find a big difference, especially when you do a wash. So I am just going to put some water on my brush. That’s the side with no gesso. It doesn’t matter how thinly I put it on. I can water this right down. That’s the difference. You can see, this has silicone or waxes or something on that primer. They do it to roll the canvas so it doesn’t stick, so they can manufacture it and get it out quicker. And I can just keep on going with this. It takes forever to try and get anything that will stick on there properly. The longer I leave that it will start to bubble and that will start to lift off. So that’s a perfectly simple easy explanation as to why gesso is important. If you want an artwork which lasts long term, no way it’s going to crack or lift off the base, that is what you call your grounds, and that grounds the artwork and the paint to it. It gives the proper tooth for that paint to grab into that canvas, and it’s the same with when you are using your mediums, molding pastes, all those things, they all stick to the canvas when you’ve got your gesso. And that’s the reason why I am telling people they should do it. I’ve had too many people having problems, and for the sake of a couple of dollars, and it really is only a couple of dollars, I’ll show you when I do a canvas now. Paint your canvas with your gesso and your not going to have a failure like you’ve seen just there. So we will go on now and I will show you how to gesso a canvas. Now I am going to quickly show you how we put the gesso on the canvas. Gesso comes in different size containers. I’ve just got a 250 ML container here or 8.4 fluid ounces and we are just going to apply it onto this canvas. Now I’ve painted the canvas grey, just so the gesso will stand out, but we can also treat it as if I am painting over an existing artwork that I’ve done and I wasn’t happy with. It’s the same process, before you paint another artwork, a good coat of gesso, and it gives good tooth and grounding for your paint. So all we are going to do, it’s just like painting anything that you might paint, very basic. Now what I’m doing with the gesso, I am justing using a gesso brush. Very cheap, buy them from your art stores. They are just a fairly course bristle brush. I use them for a lot of my painting. You will see me using them all the time. And with the gesso, I am just forcing it down into the canvas, so I am getting right down into the grain of the canvas. You can do a couple of coats if you like, depending on what you are doing, if you are really trying to cover another painting underneath. Now something that does happen with these gesso brushes because they are cheap, a few bristles will come out of them every now and then, that’s nothing unusual, one just came out there. I’ll show you a quick and easy way of getting those out. You don’t have to use your fingers. Just get your brush and flick the edge of it like that and you’ll catch that bristle and it comes off the canvas for you and it’s an easy way of picking them up and you just keep on painting. Now we are going to go right across this canvas but as you can see I am really rubbing this paint in. It’s a great primer and I am getting it deep into that canvas, because want it to go deep into the valleys as well as the top of the canvas. We don’t want to just skim it over the top. The older these gesso brushes get, they start to lose a few too many hairs, so that’s when you know it is time to get a new one and mine is losing a few here, so I just have to pick that one off which is stubborn, there you go. We just do the whole canvas in the same manner and it really goes a long way. I would prefer to do two coats as than one big thick coat. That’s how my preference is because I can work this coat right in deep into the grains and the second coat I will go in the opposite direction and work it in as well and you know you havecovered every part of that canvas. So you are not going to get any bubbling or anything like that especially if you are doing washes, that kind of painting. Using paint thick it usually goes across a lot easier, but when you are doing that thinner paint work, with washes, that is when you can run into real trouble without gesso, which I just showed you in that little demonstration. So it’s just a matter of working that in and this brush I am using is an old brush and I’ve got bristles coming out one after another at the moment. So we just scoop those off like that because you don’t want them in your artwork. You want to make sure there are none in there when you’ve gone over it. If you’ve got a better quality brush, you can use that as well. I use my brushes until they fall apart, it’s just the way I am. I might actually go onto a bigger brush. I will be here all day doing it with this brush it’s so small. I can’t get it into there so easy, we will just get some onto that brush. That’s all right, we’ll get some onto the canvas and do it that way. As I say, really get it down into that canvas, and this part that I put on there, I will just spread it right across. I have nearly finished this now. This is just the first coat and because I have painted over the top of something else, if I want a good solid base to start a new artwork, I’ll do two coats on this for sure. Now it goes a long way, that’s because I spread it really well and got a good coverage and picked up the odd hair along the way. Just make sure there aren’t any bristles in your paint when you are finished, because you don’t want to find out when it’s dry, because you can’t get them off too easily then. This is the liquid gesso primer that I am using so it’s a bit easier to apply because it’s more liquid. This is a 120 by 90 cm canvas or 4 feet by 3 feet. I can do 4 coats from one of these small containers. So just spreading it and getting it right across. I’ll let that dry and then I will do the second coat, but I’ll do it the opposite direction and by doing that, you get into all the grooves and crevices and little holes in amongst the canvas and it evens the coat out as well, so you have a nice even coat across that canvas. So by doing that, you can use any acrylic paint on top of that. You can use oils as well. So any paint will work with this because it gives such a great tooth to your canvas. Things, once they are on there, will stay. You won’t have trouble with bubbling and all that thing with your washes. So, for the sake of a few dollars to start with, what I do is if I have a half a dozen new canvases, I’ll just spend an hour or so and gesso all of my canvases. So when I am ready to start a new artwork , I have it gessoed. So let that canvas dry completely before you start painting. So I hope that has made it a bit clearer on how to do a gesso and why and once you’ve got that ready you can go away and do some happy painting. Wonderful tutorial! Thank you so much for showing us this tutorial on gesso use! Great tutorial thanks a million! Thank you for such a great, useful and educational tutorial. I am planning to reuse a painted canvas, that is painted with acrylic paints, before repainting I’m going to experiment and cover that canvas with gesso, I hope it will be successful.